People are buying vegetables at affordable prices at one of the 51 direct sale points established in Istanbul, Feb. 12, 2019. Food prices in Turkey recently spiked due to a major decrease in supply emanating from seasonal conditions, increasing costs and price speculation by wholesale distributors. In order to counter price disruptions, the Turkish government, with the help of local municipalities, launched direct sale points Monday in Ankara and Turkey's largest city, Istanbul. The shops offer the most-consumed vegetables, such as tomato, onion, potato and eggplant, at a more affordable price. While this may not be a long-term solution, the government is now considering opening more regulated sales points across Turkey, President Recep Tayyip Erdoğan said Wednesday in Ankara. In his address at a meeting for tradesman and craftsman, the president said: "In the upcoming period, we might take steps to spread the practice of direct sale points to each district in Turkey in coordination with municipalities and relevant ministries as well as with your contribution." "We will continue to take necessary steps to strengthen the distribution mechanisms and ensure people's access to food at affordable prices all around Turkey, jointly with our municipalities and with the support of our businessmen," he added. President Erdoğan also announced that the direct sales points will expand to include cleaning products and pulses, to their current list of onion, tomato, potato, spinach, eggplant and pepper. "We have launched this practice [municipal direct sale points] to offer our citizens affordable prices and unravel the wrongdoings of the price speculators. We are not competing against our tradesman, but we want to relieve our citizens of the burden of high food prices," President Erdoğan said and added that the direct sales points did not compromise free market rules. "When the prices become normal again, there will be no necessity for such practices." President Recep Tayyip Erdoğan addresses Turkish tradesmen and craftsmen in Ankara, Feb. 13, 2019. The president also drew attention to the decreasing prices at supermarket chains - where the price of 1 kilogram of tomatoes reached as high as TL 10. In the winter season, the tomato prices are usually higher than summer, but in the previous years, the highest price range would hit TL 5. Increasing fuel and fertilizer costs triggered by the slump of the Turkish lira, decreasing production, the rising number and intensity of natural disasters, and lack of action to regulate the market are often cited as the main causes of high food prices. Trade Minister Ruhsar Pekcan said Sunday that the ministry detected price increases of over 800 percent between purchases from producers and sales to customers. Pekcan added that 88 firms were fined over TL 2 million. 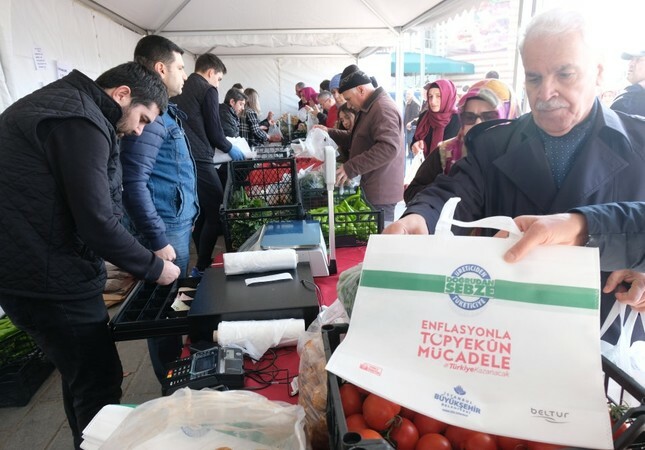 Accordingly, municipal direct sales points for fruits and vegetables, which aim to eliminate the middlemen between producers and customers, started operating Monday in 51 venues in Istanbul in central locations of the province's 34 urban districts and 15 locations in Ankara. Credit cards and debit cards are accepted at these sales points. The move from the municipalities is also important as the Turkish Statistical Institute (TurkStat) has recently updated its method of calculating the inflation rate, and the share of food and nonalcoholic drinks is now more prominent. TurkStat data showed that the increase in the same category was 6.43 percent in January, which could push the year-end food inflation rate to 31 percent if the current trends continue, significantly higher than the Central Bank of the Republic of Turkey's (CBRT) target of 14 percent. Government officials claimed that the rise in food prices has turned into a tool of exploitation against citizens, promising to stop those who "terrorize" wholesale markets. The prices at municipal direct sales points are significantly lower than the Turkey average in January calculated by the TurkStat. One kilogram of onions sold for TL 2, compared to the January average of TL 4.9. For tomatoes, 1 kilogram is sold for TL 3, half of the average price of TL 6. In comparison, 1 kilogram of potatoes costs TL 2, compared to TL 3.6 of January average.